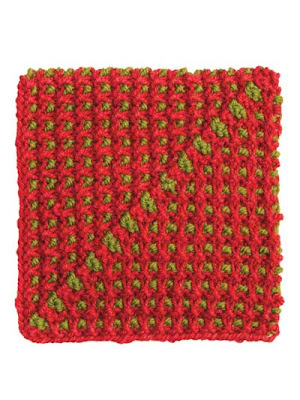 Today's Advent giveaway is the latest from the folks at Annie's -- Modular Mix: 12 Knitted Mitered Squares to Mix & Match by Edie Eckman. 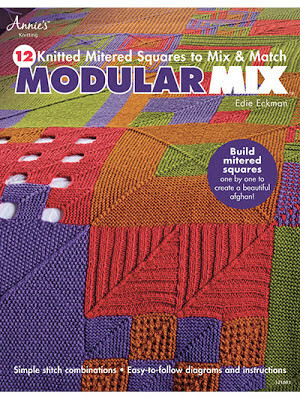 Modular Mix is a very cool book that covers ins and outs of making mitered squares. Having made a mitered square blanket in the past, I thought I already had a handle on the technique -- but oh how much there is to learn! It is actually quite simple, but I greatly enjoyed reading about the structure and geometry behind these pieces: how many stitches to cast on and why, the effects created by different decrease methods, etc. In addition, the book discusses the best ways to join the mitered squares and how to pick up stitches from one to start another. And it all comes together in one big, pretty afghan that lets you practice all of these new skills at once. In the end, you have the building blocks (both physically and metaphorically speaking) to create an afghan, or to have fun and come up with mitered square designs of your own. Another thing I like is that the sizes included for each square module are all multiples of the same number. So, if you use the same weight of yarn to make a whole bunch of them in a bunch of different sizes, they'll fit together perfectly. As with all the Annie's books I've had the pleasure of reviewing, Modular Mix is beautifully laid out, just the right size, and includes great instructions for the basic knitting techniques a newbie might be unfamiliar with. And you know the drill -- if you'd like to win a copy of this book, leave a comment here by midnight this coming Sunday (the 23rd) and this time, let me know if you've ever made an afghan before and how long it took you. (I'm tempted to make my first after reading this book!) I'll draw a winner on Sunday afternoon. Good luck and I hope you're all enjoying the holiday season! I've never knit an afghan for myself before, but I have made a couple chairity baby blankets that were enjoyable to make. 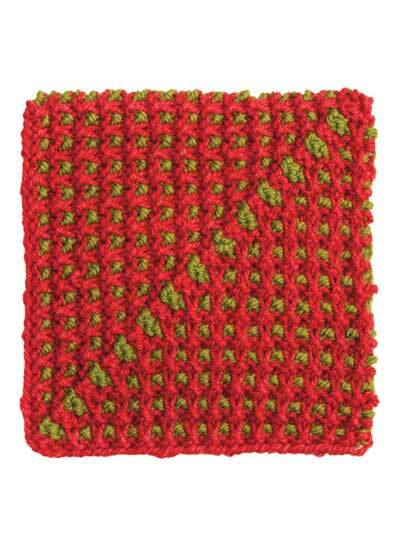 One was a bunch of log cabin squares swen together, the other was a simple crocheted one. Both only took about two, maybe two and a half months to complete, although it seemed a lot longer, even though I'm a fast knitter! I have never knit an afghan. The closest I've ever come was an entrelac baby blanket. I have made 1 afghan, but so many years ago I don't know when. I do still have it, laying over the back of the couch. 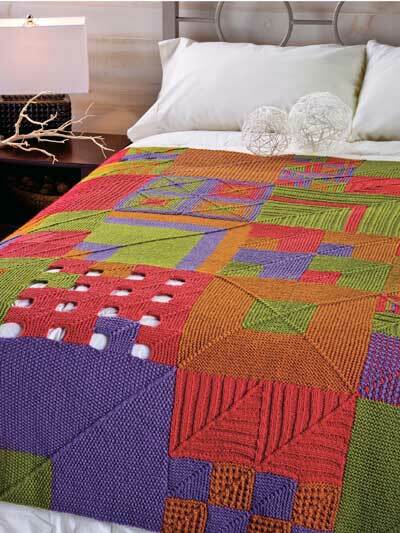 For along time, I've been wanting to make a log cabin afghan-have been collecting yarn but never started it. I have never made an afghan but I've been hearing from several friends who are making them now. This book is very tempting! I've never knit an afghan, but I've been considering it for a while. I've got lots of leftover sock yarn and this book looks like an excellent primer. Thanks for the review. I have made several afghans, but I do them on big needles so I get done quicker. It usually takes a couple of weeks on big needles because I can only knit in the evenings. I've made an afghan, but it was so long ago that I don't remember how long it took. What I do remember about it: it was knitted in one huge piece (because I didn't want to seam anything); it was columns of Aran-style cable and texture patterns, in cream-colored 100% acrylic yarn; I never bothered to check my gauge, so it came out larger than intended (I could - and did - use it as a bedspread on a single bed), but at least I had enough yarn because I'd bought enough (I thought) for a sweater too; and I eventually got so familiar with the pattern that while I was knitting on the last bit of it during my first semester of grad school, I could knit while doing my Latin homework reading. I finally had to throw it away recently, after many years of use; it had been washed many times, but it had also been slept on by cats so much that I was afraid one more laundering would kill the washing machine with all the cat hair. I'd love to win a copy of the book, as I've been contemplating knitting another afghan soon, in nicer yarn this time! Yes I've made a couple of afghans. I'm quick if I like, but have one languishing for about 6 months!!! Probably will be frogged. I'd love to have this book in my knit library. Thank you. 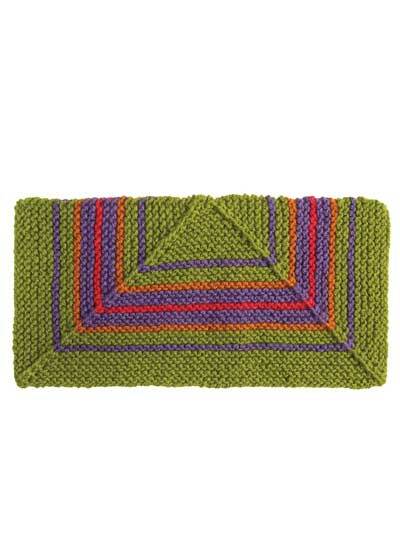 I have never knit and afghan but this book may make me do one - love the mitred squares !! I have never made an afghan and this book would be the best guide to start me off. I'm currently making my first afghan--the Ten Stitch Blanket. I've been working on it for a month now and the going gets slower as it gets bigger. Hopefully I can get it done before Winter's end! I've knit one baby blanket and I've crocheted two afghans. The baby blanket took 18 days and was 32 inches square. The first afghan tool me a month and a half. It came out huge and after doing the base of double crochet, I had weave about 200 chains through the wholes. A million yarns ends. The second afghan is ongoing. Started it in July, but I only work on it off and on. I've never made a large afghan before but I've made a few large baby blankets. They've been kind of mindless so maybe a week total in knitting but not straight through. At the rate my friends are reproducing, I could definitely use this book! Thanks for the giveaway. I've not made an afghan yet but I have knitted one baby blanket. Those are mighty pretty miters, and I would like to try making some from the book. Thanks! I have 2/3 of a large crocheted blanket that was left by the wayside as soon as I learned to knit. I've only ever made baby afghans but have pipe dreams of making s grown up one since day. I have knit two afghans in large squares. Both took years! This one looks intriguing and I'd love to try it. Thank for the chance! I've never knit an afghan, but I have crocheted some baby blankets. They took me about 2 months each since I'm not a fast knitter or crocheter. 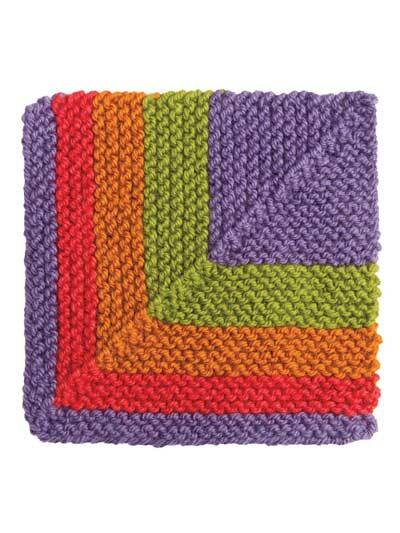 I love the idea of mitered square blanket, a great way to use extra yarn. I have made afghans in the past but very simple knits with some cables. Lately a number of baby blankets have been knit taking a month or so each. 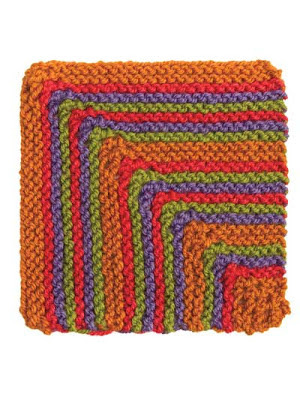 I would really enjoy knitting a colorful afghan using a new technique . Happy knitting. Modular knitting is one of those things I've wanted to learn more about but haven't made the time for yet. This book looks like it would be a great way to do so! Thanks for the blog and the opportunity. I love afghans and have made a few. A woven one took several weeks, but a complicated knitted one took several years! Thanks for doing the giveaway!